Today I would like to share some thoughts with you on the subject of thanksgiving. It should be for Americans raised to the level of a holy day. It should have something of the spiritual and the sacred in it considering what God has given to us. Usually, at thanksgiving it is easy to say that we are living in the best country in the world. And by all comparisons this is quite true. When we talk about the problems we have as a nation and compare them with other nations, we are not as bad off as we are inclined to think. When we talk about living in peace as we do, our situation is quite unique. When you think of the horrible fact that 4% of the people in this country live below the poverty line, we know that its bad enough, but then when you compare it to the hundreds of million that are starving throughout the world, for some reason or other the problem does not seem to be as severe. When you consider all the violence that is in our society, and it is of terrible proportions, it still does not seem to be as violent as the cases we hear about in Iran or the horrible kinds of violence shown in the German concentration camps of Buchenwald and Auschwitz . All of these points seem, especially when they apply to different cultures and different countries, quite academic. 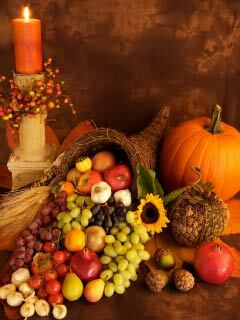 It is something to be thankful for that we have been spared the tragedies of other nations and peoples, but that in itself is not enough to help us make thanksgiving more spiritual and sacred, more of a personal holiday. This coming holiday should remind us of what God has given to our families. This should highlight our sense of gratitude. Prior to the coming of the show, Fiddler on the Roof, there was a story that formed the basis of this musical about a son who was successful, who had more. Materially successful as he was, he was always discontent. His father, after hearing all his complaining and griping, said, my son, be thankful for what you have today, God never promises anyone tomorrow. Thanksgiving is the day to thank God for what we have, not complain about what we lack. Just reflect on how often we take peace of mind, a special gift that God has given to us, for granted. All you have to do is just walk through a mental hospital or a mental clinic and see the vast majority of people, young and old, trying to recapture the peace of mind that you and I take for granted. None us, when you see all the terrible attempts at suicide, when you see how depressions of different kinds, when you see mental and emotional problems that cannot be reached by medication, none of us can take the peace of mind that God has given to us for granted. If there is any time in the history of the calendar of a year that should stop your griping and complaining, this is the time, this is the day. All of us know that when we get a child or children who are always testing you for whatever reasons, we all know how fed up we get. The whining child, that child who is always testing you, that person who is looking always for more attention in the home than the rest, that person who is often masquerading behind self-induced emotional problems just to get attention, all of these can reach us and bother us a great deal. I think it must be the same way in the sight of God when his children never stop complaining, never stop asking, always feeling that they have been shortchanged. There must come a time, even in the life of God, when he gets tired of the one who never has the gratitude that should be expressed. In the Gospel story of the ten lepers, we have the classical story of ten people we were cleansed and received a special favor from God. Nine out of ten walked away and never gave thanks to God for what he had done. Only one returned to give thanks. We have been blessed more than many others. We, as a family, have been blessed more than many. Is it possible that nine out of ten of those so blessed will walk away and not thank God. Thanksgiving is the week to remind ourselves if we have shown sufficient gratitude for what God has given us. Thanksgiving is the day to remind ourselves of what we owe God. Thank God for what you have today, God never promises anyone tomorrow.